Kenya's president has announced that fees will be removed for anti-retroviral drugs (ARVs), which combat the effects of Aids. Correspondents say the fees are one reason why only 60,000 of the 200,000 eligible Kenyans are taking ARVs. The UN has said Kenya is one of the few countries to reduce HIV prevalence, from 14% in 1997 to 4% today. 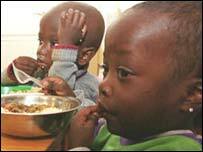 But charities now say that a hunger crisis in parts of Kenya could hamper the effectiveness of ARV programmes. President Mwai Kibaki said the 100 shilling ($1; 54p) fee per dose would be waived "with immediate effect" in public hospitals and clinics. Mwihaki Kimura Muraguri, HIV/Aids programme manager with the African Medical and Research Foundation (AMREF) Kenya welcomed the decision as "a critical step". "We look forward to seeing reduced costs for treatment support such as lab tests, whose costs are still prohibitive," he said. Humanitarian agencies led by Cafod say food shortages are hampering Aids patients' ability to tolerate ARVs, which has led some people to cease ARV treatment. East Africa's worst drought in a decade has affected 3.5m Kenyans. Doctors are calling for food rations to be built into Aids programmes, warning that people coming on and off medication increase the risk of drug resistance. The BBC's Karen Allen in Nairobi says little is being done for the 1.1m Kenyan children who are now orphans as a result of Aids. In some of the poorest parts of the capital, Nairobi, every fifth house you come to is run entirely by children, our correspondent says. Huge stockpiles of anti-retroviral drugs are languishing in Kenyan warehouses, some of them past their expiry date. A shortage of trained staff, and understanding about the potency of these drugs along with a lack of testing facilities to enable blood readings to be taken regularly, are blamed for the wastage.